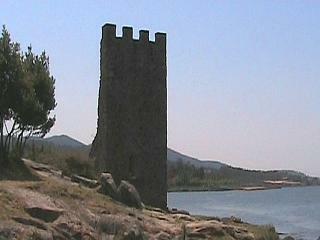 More history of Catoira's Towers of the West. 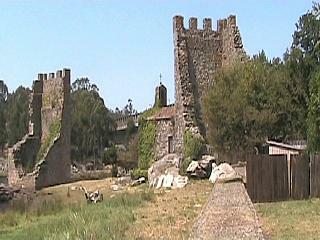 Recognizing the significance of Catoira's strategic position, the Bishops of Iria-Compostela, along with noblemen and the King, had the fortress that is now known as the Two Towers constructed. Its aim to protect Santiago de Compostela and Ira Flavia (another Lord of the Rings sound-alike) in Padron from the Viking raids. The venture proved successful and the remains of this endeavor still evoke images of what must once have taken place there. 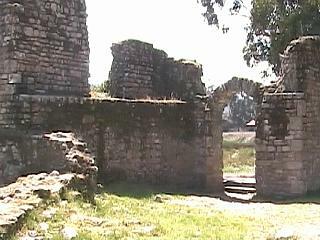 Below, the remains of one other structure can also be seen at Catoira at the far end of the forts wall at the farthest point from the two towers. In the twelfth century the towers came to the rescue again and became the strong hold of the Archbishop during dangerous times. As a result, they became known as the "Key and Seal of Galicia" and their importance continued on for several centuries. The chapel, connected to one of the towers, was built during this period and it is also said that Spain's first fleet of battleships were based there. Even in the eighteenth century the "Torres de Oeste" continued their service with the repelling of an attempted invasion by the English in 1719. Catoria's Viking festival, mentioned earlier, is a celebration of the towers success in fending off the nordic invaders. Each August the attempted invasion is reenacted with members of the town taking on the role of both Viking and defender. At the end of the battle all parties celebrate with a feast of wine, lamprey and mussels. Are Catoira's Towers of the West worth a visit. Well first of all I am convinced that J.R.R.Tolkien, who had an interest in history and was extremely well read, encountered these towers and the images that they conjure up and used them for the inspiration of "The Two Towers". - And if he did not, one of his illustrators certainly did. The Towers of the West are definitely worth a visit if you like history and, falling on them by accident as we did, made them an extra bonus to our day. The fact that they are now partially hidden under a bridge detracts very slightly from their visual significance, but we soon forgot about that as we explored. As a cautionary note, they are not gigantic structures that tower above everything, but they impressed us anyway. In summary, if you like old ruins, these are not to be missed.